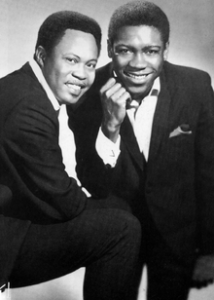 I am listening to a Sam & Dave cd. I saw it in a catalogue and thought, “Wow I loved their music; I’m going to spend $6 on these tunes.” My big indulgence, I won’t buy cds just for background sound. I thought, hearing these songs will be making me happy. It turns out the cd has recordings they made when they were trying to make a come back. The first song on the cd was Soul Man. It didn’t sound right at all. I can hear that song in my head like it’s still 1967. I looked at the liner notes. What a let down. It even says these recordings in Nashville, late 1970s-early 1980s, did not do the job for them. If you do not immediately hear the sounds when you hear their names, you should check them out. Their singing is the real thing; do listen. My age cohort and dear friend, Jackie, claimed she’d no idea, said, “Was I living in a cave?” She looked on youtube and found them. She wrote that she especially admired their moves. That’s right. They were famous for working up major sweat in every performance. They did it. The tenor is Sam Moore; the baritone is Dave Prater. The heart of their soul music was produced at STAX records, in Memphis. The truly big years were 1965 – 1968. It’s Soul Man; Hold On, I’m Comin’; You Don’t Know Like I Know; When Something is Wrong With My Baby; Wrap it Up. As it turns out, great duo that they were in the studio and on the stage, they did not get along. For years, they couldn’t speak to each other; always arrived separately at recording sessions. STAX records were distributed by Atlantic Records. There was a fight between the companies. Atlantic scooped up Sam & Dave and took them to New York, but somehow their work there didn’t top the charts like the songs of the STAX years. They are in the Rock & Roll Hall of Fame, the Grammy Hall of Fame, won the Grammy, had multiple Gold Records. They had more success on the R & B charts than anyone with possible exception of Aretha Franklin. Soul Man, according to the Grammys is one of the most influential songs for 50 years. I think that means a lot of other acts tried to sing it. They broke up in 1969, reunited in 1972. Dave found a new Sam, Sam Daniels, 1982 until Dave’s death in a car crash, 1988. Sam Moore continues to perform. More power to him. Regarding this cd, I might donate it to the library book sale just not to be depressed by it. 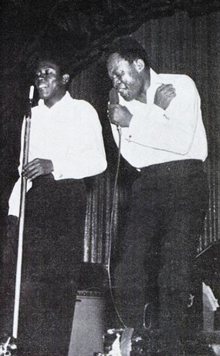 pictures: top, Sam & Dave, 1967, bottom, Sam & Dave, 1966. Sam & Dave: the Nashville Soul Sessions, FUEL 2000 Records. This entry was posted in Hedgehog Highlights and tagged 1960s music, Atlantic records, Dave Prater, Hold On I'm Comin', Sam & Dave, Sam Daniels, Sam Moore, Soul Man, soul music, STAX records on October 10, 2015 by Leslie.